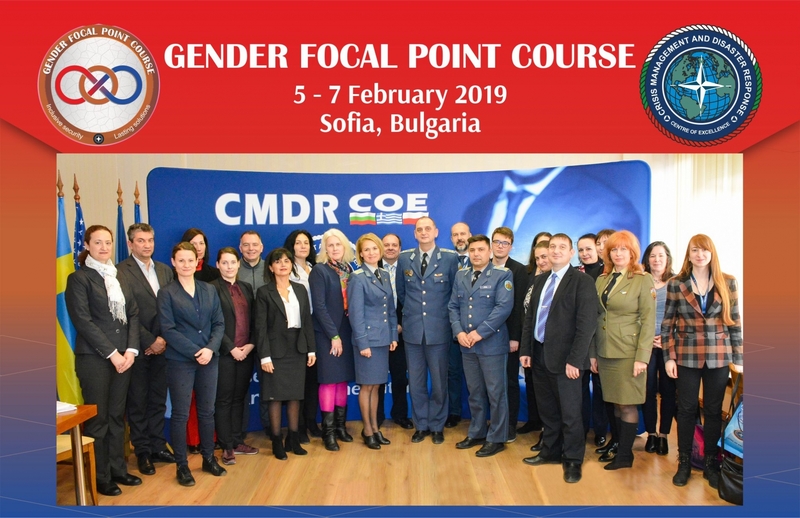 Delivering on its commitment to support the integration of gender perspectives in NATO crisis management, the CMDR COE conducted the first NATO Gender Focal Point (GFP) course from 5 to 7 February 2019 in Sofia. The GFP pilot is an original training solution to an identified training and education gap within NATO, and marks a culminating point in the joint collaborative efforts of the CMDR COE and the Nordic Centre for Gender in Military Operations (NCGM) - NATO Department Head for Gender in Military Operations. The first cohort of NATO Gender Focal Points (GFPs) included representatives from NATO Ally and Partner Nations, and NATO partner organisations. Being experts in their respective functional area, the course participants received gender awareness training which to enable them to perform successfully as GFPs within strategic and operational organisations. Focusing on building gender mainstreaming skills; sensitivity to conflict related sexual and gender-based violence (CR-SGBV); and on showcasing the importance of integrating gender perspectives in a systematic, informed, and cooperative manner in every activity, the pilot course provided knowledge and understanding on how a GFP supports and contributes to, on one hand -mainstreaming gender perspectives within their chain of command, and on the other - within the larger organisational efforts. The GFP pilot course methodology was premised on adult learning - a method enabling the active involvement of trainees in the process of learning by encouraging critical thinking, communication, and problem-solving based on individual approach and creativity. Engaging trainees in the "creation" of knowledge, the CMDR COE seeks to foster the capacity to draw on past experience so as to facilitate the internalization - storage and retrieval, of new knowledge through, inter alia, the use of audio-visual and hands-on techniques. The next iteration of the GFP course will soon be announced.